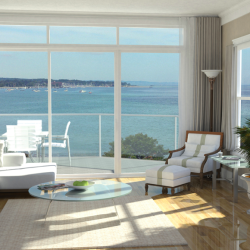 For all its luxurious amenities, one thing is immediately clear about the new 537 Bay Street: It’s all about the view. It is, in a word, breathtaking. Looking out from your top-floor balcony, the blue of the bay spreads out before you with indescribable beauty. (You can almost imagine how an eagle soaring above the water must feel!) With your morning coffee in hand, you’re free to survey all that lies below. 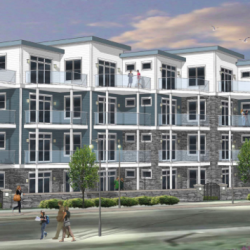 Situated just 300 feet from West Grand Traverse Bay, 537 Bay Street is the newest addition to Traverse City’s celebrated waterfront. These luxury condominiums have been thoughtfully designed to offer all the latest and most desirable amenities. 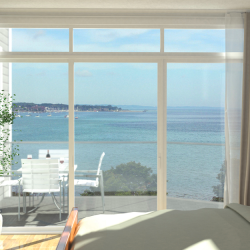 All units have stunning views from multiple balconies and strategically placed windows and doors. The average unit size is 1,700 square feet, providing plenty of space for family and friends. Each unit also has 270 square feet of exterior living space...perfect for outdoor dining and entertaining. The kitchens and bathrooms feature state-of-the-art appliances and features as well. Each lower level unit has its own private patio and garden.